Prophy (regular cleaning) or Prophylaxis means to prevent disease before it occurs. Dental cleaning helps to prevent plaque, tooth decay, and gum disease. The purpose of the dental cleaning procedure is to prevent, rather than treat or cure an existing disease. Prophylactic measures are divided between Type I prophylaxis (to prevent the development of a disease) and Type II prophylaxis (whereby the disease has already developed and the patient is undergoing maintenance to protect against worsening of this process). Gingiva are part of the soft tissue lining of the mouth. They surround the teeth and provide a seal around them. Compared with the soft tissue linings of the lips and cheeks, most of the gingiva are tightly bound to the underlying bone and are designed to resist the friction of food passing over them. Healthy gingiva is usually coral pink, but may contain physiologic pigmentation. Changes in color, particularly increased redness, together with edema and an increased tendency to bleed, suggest an inflammation that is possibly due to the accumulation of bacterial plaque. The most common diagnostic tool to a dentist is the Dental X-ray. Crowns previously known as caps, are used to entirely cover or "cap" a damaged tooth. Besides strengthening a damaged tooth, a crown can be used to improve its appearance, shape or alignment. A porcelain crown can also be placed on top of a dental implant to provide a tooth-like shape and structure for function. Porcelain or ceramic crowns can be matched to the color of your natural teeth. Porcelain is used because it is both strong and attractive. Bridges may be recommended if you're missing one or more teeth. Gaps left by missing teeth eventually cause the remaining teeth to rotate or shift into the empty spaces, resulting in a bad bite. The imbalance caused by missing teeth can also lead to gum disease and temporomandibular joint (TMJ) disorders. Bridges are commonly used to replace one or more missing teeth. They span the space where the teeth are missing. Bridges are cemented to the natural teeth or dental implants surrounding the empty space. These teeth, called abutments, serve as anchors for the porcelain bridge. A replacement tooth, called a pontic, is attached to the porcelain crowns that cover the abutments. Porcelain crowns or ceramic bridges can be matched to the color of your natural teeth. Bonding involves the direct application of tooth colored composite resin and is typically used to create a more attractive smile. Tooth colored fillings are an alternative to the traditional metal fillings and fall into two categories; direct and indirect. Direct restorations are composite resin applied in one appointment. Indirect restorations (inlays or onlays) are made of porcelain or composite resin materials fabricated by a dental laboratory. These restorations usually take two appointments. A Filling or a dental restoration is a restorative material used to restore the function and integrity of missing tooth structure. The structural loss typically results from decay or external trauma. A diagnosis of fillings is determined by the loss of tooth structure visible on the radiographs. All dental restorations can be further classified by their location and size. 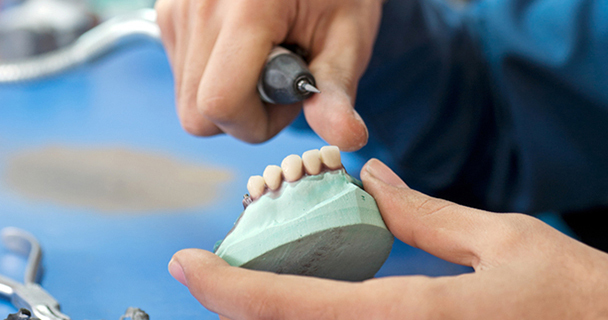 This technique involves placing a soft or malleable resin filling into the prepared tooth and building up the tooth before the material sets hard. The advantage of direct restorations is that they usually set quickly and can be placed by one operator. Since the material is required to set while in contact with the tooth, limited energy can be passed to the tooth from the setting process without damaging it. Where strength is required, especially as the fillings become larger, indirect restorations may be the best choice. This technique of fabricating the restoration outside of the mouth using the dental impressions of the prepared tooth. Common indirect restorations include inlays and onlays, crowns, bridges, and veneers. Usually a dental technician fabricates the indirect restoration from records the dentist has provided of the prepared tooth. The finished restoration is usually bonded permanently with a dental cement. It is often done in two separate visits to dentist. While the indirect restoration is being prepared, a provisory/temporary restoration is used to cover the prepared part of the tooth, which can help maintain the surrounding dental tissues and prevent harm to the tooth. Laser means to remove destructive bacteria from the periodontal pocket of the tooth. Our primary goal of all periodontal therapy is to control infection. The frequency and type of treatment will vary depending on the severity of the disease. All treatments require that the patient maintain a strict oral hygiene routine. Initial deep scaling and irrigation with antimicrobial solution followed with periodontal maintenance in three months. Deep scaling (root planning) and irrigation with antimicrobial solution. If needed use of localized antibiotic (Arestin) treatment followed with periodontal maintenance in three months. Deep scaling (root planning) and irrigation with antibacterial solution and Laser therapy followed with 3 month periodontal maintenance. Laser Periodontal Therapy™ is a laser-based approach to gum disease using an Nd:YAG free running pulsed laser requiring knowledge and skills drawn from whole dentistry. To you the patient this means: less pain, less bleeding, less swelling, less tissue removed, less down time, and less recovery time which is decidedly less costly to you. Allow healing to take place. Controlling periodontal disease makes it possible to save and restore otherwise hopeless involved teeth as well as create a balanced smile. Periodontal Maintenance cleaning is a deeper cleaning which is performed when the bone that supports the teeth has dissolved leaving the root exposed. The cleanings are needed more often to “maintain” the bone level and slow the disease progress. Our goal is to prevent this condition from progressing in our patients, by maintaining the teeth and bone. Periodontitis refers to an inflammatory disease affecting the tissues that surround and support the teeth. Periodontitis involves progressive loss of the bone around the teeth, and if left untreated, can lead to the loosening and subsequent loss of teeth. Periodontitis is caused by bacteria that adhere to and grow on the tooth's surfaces, along with an overly aggressive immune response against these bacteria. A diagnosis of periodontitis is established by probing the soft gum tissues around the teeth and radiographs, to determine the amount of bone loss around the teeth. Root Planning is an even deeper cleaning that may be necessary if the condition is left untreated; or it will lead to ultimate tooth loss. The root planning cleaning may be necessary to remove the bacteria and slow the disease progress to prevent the need for periodontal surgery. When you have a root canal, you are removing the nerve of the tooth. The tooth will no longer be nourished by the body and therefore be dead. You will not feel pain from the tooth when the root canal is complete, but it is still susceptible to decay. Molar teeth can have 4 roots, therefore you are getting 4 root canals on molar teeth, which explains why they take longer and cost more. Even though the tooth will be clinically dead, it still performs a valuable function. The tooth continues to maintain your natural bite. If you remove teeth without replacing them, they collapse into the area altering your bite for evermore. Sedation dentistry is available for large treatment plans and phobic patients. We understand that some patients get nervous going to the dentist. Robert F. Murray, DDS is trained in sedation dentistry. In most cases our patients are not afraid of Dr. Murray and do not require sedation, but we can offer it if you would like. We use medication or general anesthesia for your comfort during your dental procedure.